Ancestor Spirit, Hex Bane and Dark Presence! Greetings, Ashes players! 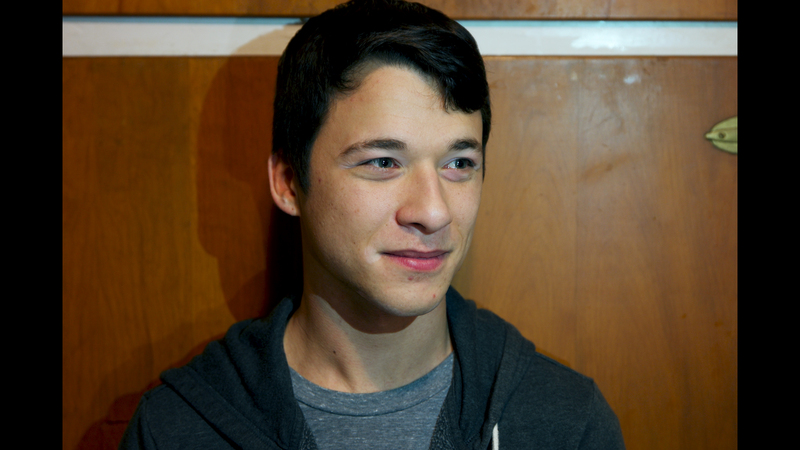 Welcome to the final preview of this reveal season! Earlier this week we finished previews for the King of Titans expansion deck, and today we will wrap up the Ghost Guardian. It has been quite the ride seeing all of the new spells and units that will be entering the fray. Let’s dig in! 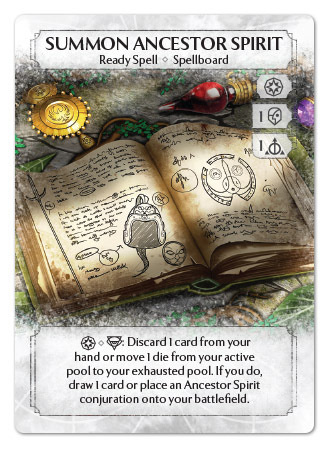 Here we have a new illusion-based conjuration: Ancestor Spirit! This summon spell has an expensive upfront cost of two dice, but makes up for this with a flexible and affordable summon cost. For one card or one die, you can summon an Ancestor Spirit or draw a card. 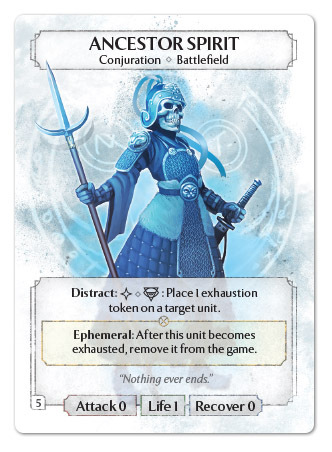 Ancestor Spirits are a control-oriented conjuration with their Distract ability allowing you to exhaust a unit in play. This is a very affordable exhaust effect, but it is limited to five uses throughout the game due to the Ephemeral ability. When an Ancestor Spirit is exhausted, they are gone for good! Players will have the option to put out Ancestor Spirits as a cheap blocker or use them for their exhausting capabilities, and when all your spirits are gone, you can still use the summon spell to cycle through your deck! Next up is a sympathy ready spell built to retaliate against some of the most fearsome effects in Ashes! Hex Bane let’s you return the favor any time an ability or dice power is used to exhaust your dice or deal damage. 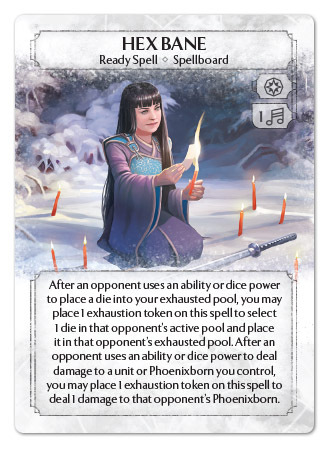 This lets you reduce the dice advantage of heavy exhaust strategies from the likes of Victoria, as well as send back natural dice pings, Fire Archer ambushes, and Jessa’s signature Screams of the Departed back to the Phoenixborn from whence they came! All in all, Hex Bane is an affordable option to combat some very common effects for anyone with spare spellboard slots to consider. Lastly we have an exciting addition to the cardpool for fans of ‘mill’ strategies: Dark Presence! 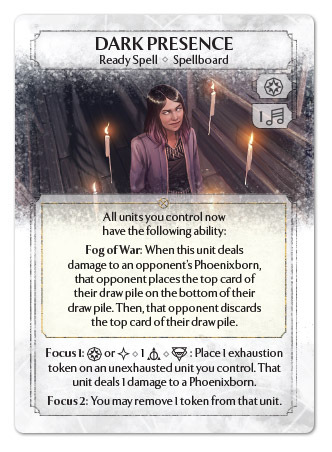 This ready spell provides the passive ability Fog of War to all units you control, giving them the power to whittle away at your opponent’s deck any time they deal damage to the enemy Phoenixborn. This includes attacks from your units as well as effects like Stormwind Sniper’s Ambush and Admonisher’s Rebuke. When Dark Presence becomes focused, it gives you the power to let your units sneak in direct attacks to the Phoenixborn, continuing to tear their deck to shreds. You may even get to heal or unexhaust your unit if you make it to focus 2! That’s all for now! Thank you all for reading this preview series. It has been an honor to share with you all of the new cards and strategies coming to Ashes next. I hope you look forward to trying them out!